MWC 2018: Lenovo launches Yoga 730 (13-inch & 15-inch) and Yoga 530 (14-inch). 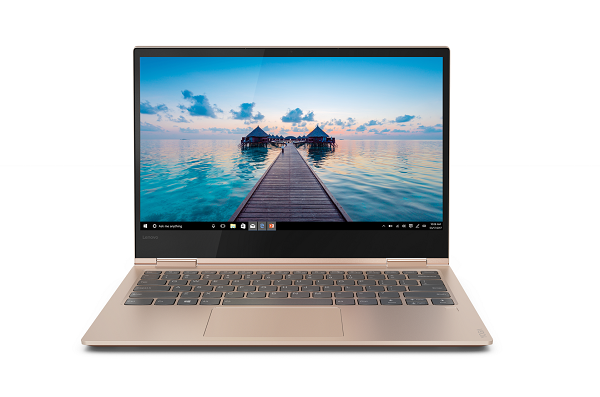 At MWC, Lenovo introduced the new Yoga 730 (in 13-inch and 15-inch models) and the new 14-inch Yoga 530 - the latest additions to its 2-in-1 family designed for the mobile generation. The new Windows 10-based convertibles feature modern designs, powerful laptop performance and tablet portability. The new Yogas come with up to a UHD IPS touchscreen display on the Yoga 730 and a FHD IPS touchscreen display on the Yoga 530, with razor-thin borders, so you can swipe, pinch and tap to browse the web. Engineered with up to the latest 8th Gen Intel Core i7 processors, optional NVIDIA GeForce GTX 1050 discrete graphics (on the 15-inch Yoga 730) and comfortable full-sized keyboards. But beyond typing and clicking, you can now tap, write, or just speak to the new Yoga 730 and 530 to input commands. You can use the optional Lenovo Active Pen 2 with 4,096 levels of sensitivity to write, draw or annotate with Windows Ink for a pen-on-paper experience. For an added layer of security and personalization, you can also log into your Yoga with its integrated fingerprint reader through Windows Hello. The Yoga 730 harnesses the power of AI to give you more choice in intelligent assistance. With both Alexa and Cortana built-in, the Yoga 730 incorporates not one but two distinct, voice-enabled, intelligent AI's. Use Cortana on your Yoga 730 during the day to schedule meetings, get reminders, search and send emails and manage to-do lists with just your voice. Or just ask to order food, do your shopping, dim the lights and turn up the music at night with Alexa on your Yoga 730. Far-field microphones make it easy for Alexa and Cortana to listen and respond even from across the room. You can now do thousands of things with just your voice as Alexa and Cortana continue to get smarter, adding more apps and skills to help you save time at work and at home. The Yoga 730 comes with up to a UHD (3840x2160) display, JBL speakers, and Dolby Atmos immersive audio. Connect the Yoga 730 to a 4K display through the laptop's blazing-fast Thunderbolt 3 port to increase your productivity. The new Yoga 730 features a longer battery life of up to 11.5 hours on the 13-inch model and up to 11 hours on the 15-inch in FHD. With Rapid Charge, in just 15 minutes you can get up to 2 hours of usage of your Yoga 530 and 13-inch Yoga 730 to help power you through your day without worrying about plugging in. In EMEA, the 13-inch Yoga 730 with Lenovo Active Pen 2 included will start at €999 (VAT included) and the 15-inch model with Lenovo Active Pen 2 included will start at €1,099 (VAT included), both expected to be available on www.lenovo.com and select retailers starting April 2018.5 The 14-inch Yoga 530 will start at €549 (VAT included), expected to be available on www.lenovo.com and select retailers starting June 2018.